Although the calendar, the stars, the sun and the moon say spring has arrived today, today's weather in the Adirondacks defies them all. It is currently snowing as you can see in today's photo from the homestead. The weather forecast is calling for six inches of snow with nighttime temperatures in the single digits over the next few days. Sounds like winter to me! The truth is, this is very standard March weather here in the lovely Adirondack Mountains of upstate New York. Spring is one of my favorite times to ski. The cold night temperatures and then warm spring sunshine create lovely corn snow, which can ski nicer than powder. If you are one of the few who do not run south for spring vacation, you might consider a spring ski excursion to the Adirondacks. 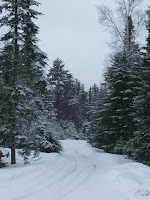 Skiing is still great in New York State - especially in the Adirondacks!